Lois Walker, age 85, of Stockbridge, Georgia, passed away on Friday, January 18, 2019. Lois was a member of Beacon Hill Missionary Baptist church. A funeral service will be held on Saturday, January 26, 2019, at 4:00 pm at Crowell Brothers Funeral Homes & Crematory, Peachtree Corners Chapel. The family will receive friends on Friday, January 25, 2019 from 5:00 pm to 8:00 pm at the funeral home. Lois is preceded in death by her husband, Willie Walker. 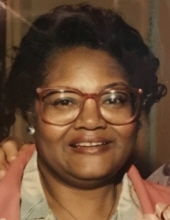 She will be greatly missed by her son, Steve Howard; daughters, Denise Mitchell (Titus) and Theresa Kim Walker (Carr); sisters, Jeanette Dillard and Norma H. Guerin; 13 grandchildren; 35 great grandchildren; 13 great great grandchildren. On-line condolences may be expressed at www.crowellbrothers.com. Arrangements entrusted to Crowell Brothers Funeral Homes & Crematory, 5051 Peachtree Industrial Boulevard, Peachtree Corners, GA 30092. 770-448-5757. To send flowers or a remembrance gift to the family of Lois Walker, please visit our Tribute Store. "Email Address" would like to share the life celebration of Lois Walker. Click on the "link" to go to share a favorite memory or leave a condolence message for the family.